Gurdjieff himself said he intentionally "buried the dog"concealed the deeper meaning or levelsin the three series of his initiatic writings that comprise All & Everything. So there was a certain expectation in reading John Henderson's book, which professes to provide the means to unlock or "excavate" these hidden meanings. In the course of this overlong book, the author gives several examples of the "excavated dog." Some are directly given, others he gives clues and direction to so that the reader may find these himself or herself. This he does under the guise of providing tools for the reader to continue the further unearthing. But why write such a book? If this had been Gurdjieff's intent, he could have just given this material, rather than buried it. That said, there is also a question of Henderson's methodology, as he presents what could be called a mechanical method of excavationuseful but incomplete and at times leading to a wrong interpretation. The author does appear to have a real appreciation for The Fourth Way. He considers Gurdjieff's writings to be a Legominism [we use the older spelling] which was used to help "hurl" the teaching into the future. Additionally, the book also has a strongly held, deeply felt, and recurring theme that those who revise the writings of Gurdjieff, even for what they perceive as honorable motives, are deeply misguided. The most obvious example is the 1992 revision of the English translation of Gurdjieff's First Series: Beelzebub's Tales to His Grandson. Unfortunately, after being pulled from the bookstores, the 1992 edition is again available and the revisions are quite significant. Other examples of revision given throughout the book are primarily from the Third Series: Life Is Real Only Then, When 'I Am'. They may well be true, but there is no way to verify some of these claims. The general sense is of Henderson's relentless parsing of words and punctuation and searching texts of available books, as well as other material published and unpublished, to prove a conspiratorial incompetence. Like a medieval defrocked monk powered by faith in his own conclusion, cloistered with his books, texts and computer, he picks and chooses examples that "prove" his belief and that he, John Henderson, has deciphered both the means and the meanings of "the hidden dog." One example of the directly given "excavated dog" is Henderson's opinion that the Akhaldans were not as they were presented in a typical reading of Beelzebub's Tales. That is, they were not "that truly great society of ordinary three-brained beingsa society which in its time was throughout the whole universe called 'envied for imitation.'" The process by which Henderson gleefully comes to his misconstrued, not very relevant conclusions is illustrative of his methodology. To prove his conclusion, Henderson goes into many different passages and punctuations too detailed to be examined in this review. However, it is interesting and revealing to see how he digs the footing of what is to become the foundation of his edifice for the "unveiling" of the Akhaldans. Henderson begins by quoting Orage: "What is Akhaldan? Khaldan means 'moon,' 'A' means 'not'. . . . " This partial quotation is the start of a long process of proving that the A-Khaldans, as he calls them, are men without an internal moon, without essence. In other words, they have no possibility of growth of being and are, in effect, dead. "What is Akhaldan? Khaldan means 'moon,' 'A' means 'not' or 'against.' He is a seeker, a ponderer, one who struggles against the current of ordinary life, which flows down the scale to supply the needs of the moon." It is not until a reader is much further along in the book, some 190 pages later, that Henderson gives the full quote in which Orage's interpretation is seen as completely opposite of his. By producing the quote, he belatedly retains a crumb of credibility, though he does so at a cost. The cost is that one of his "wise men," Orage, is in Henderson's opinion wrong and that he is right. Thus, he puts himself at a "higher" level of understanding than Orage, a very dubious position. It is not that Henderson is wrong in all his excavations, but he appears to be far from the deep level of understanding that would seem to be requisite to authorship of such a book. He presents the Work after Gurdjieff's death as a kind of Da Vinci Code-like conspiracy, but with the premise that Gurdjieff foresaw and created it all, and Henderson has "cracked" the code. Self-described as being "cocky" in his early years, this feature has developed into an "inner swagger" shown by Henderson's writing page after page aping Gurdjieff's unique style of writing, and thus putting himself on Gurdjieff's level. This of course will be immediately refuted but there he/Gurdjieff is. 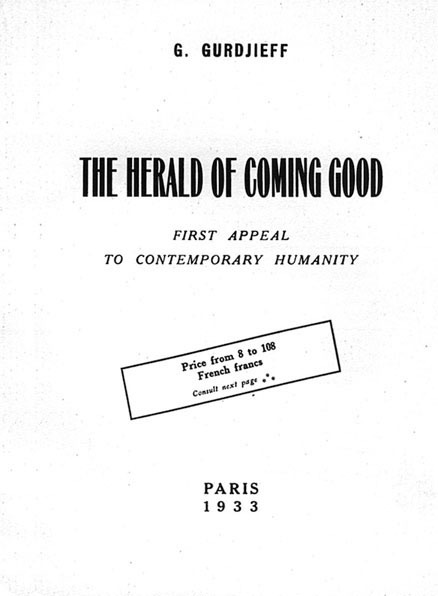 Henderson's basic premise is that Gurdjieff's booklet The Herald of the Coming Good (which he fully reprints within his book) is the key to deciphering Gurdjieff's other writings. He elevates Herald to a high position since it is Gurdjieff's only book that has not been revised. Henderson believes Gurdjieff foresaw that all his other writings would be tampered with and so he disowned it and withdrew Herald from publication. There is general agreement that Gurdjieff, with his deep understanding of man's psychology, by telling people not to read Herald, likely intended it to be read. Henderson, though, does not stop there. He holds an unwavering conviction that another book is the key to the understanding of Herald. This book is Teachings of Gurdjieff by C.S. Nott. Nott spent time with Gurdjieff at the Prieuré and later with P.D. Ouspensky, and this book, as well as his Journey Through This World, are well worth reading. The problem is not the books but that Henderson anoints Nott as a "Patriarch of the Work." Two othersA.R. Orage and Frank Pinderare also so anointed and together they make for Henderson "The Three Wise Men." He believes their writings hold the keys to the key (Herald) to the unlocking of Gurdjieff's All and Everything. This rather fantastic belief is supported not by facts but by Henderson's infatuation with his own "discovery." Gurdjieff's other direct students Henderson essentially consigns to varying degrees of ineptitude, with some accused of engaging in nefarious conduct (revisionism). He lumps all together in the role of what might be called "useful fools." Henderson is particularly disparaging of two of the primary leaders of the Work. Mme de Salzmann he equates with the poisonous gas "Zilnotrago" or "cyanic acid," and Lord John Pentland is dismissed as essentially her lap dog. (Interestingly, there is no indication that Henderson ever met or spoke with either Mme de Salzmann or Lord Pentland.) Henderson's denigration of Gurdjieff's direct students goes far beyond their struggles, and essentially shows no respect for the roles they filled and the extraordinary efforts they made in keeping the teaching available to those in the Work today. As for Henderson himself, he was apparently in two minor Gurdjieff Foundation groups for an unknown period of time. The first was in Birmingham, Alabama, with Dr. McCoy and his wife, Adrienne. The second was near Philadelphia with Tom Forman, whom he calls "The Elder Statesman" of the Work, a questionable view on many counts. These "credentials" are given to assure the reader that our author tried it the "official way" and found it lacking. Perhaps Henderson's most confused conclusion is the rejection of the requirement for group work. His claim is that group work is a relic of past failed "experiments" dating from the Russian period. His supposition is that by reading Gurdjieff's Legominism and the writings of Nott, Orage and Pinder, and doing the exercises "embedded" within these writings, that one can find all that is needed to bring one to a high state. From this acquired state, the deeper meanings of the writings can be understood; and thus one actually has Gurdjieff as one's teacher (or is it Henderson?). It is here that Henderson seems completely disconnected from the reality of life that is continually presented in Gurdjieff's writings. This is what Gurdjieff calls "The Terror of the Situation." This "Terror" is what students of The Fourth Way, after much work, from deep personal experience can come to understand. That is, we are all mired in the "Situation." How does a fragmented human stuck in a waking state of "hypnotic sleep" while held in a prison of self-love and vanity, awaken oneself? Henderson's answer will appeal to the many people who have been inspired by the ideas of the Work, but whose self-will and self-delusion keep them from entering the Work or, like Henderson, having had a taste of group work and left or been asked to leave. They remain, as Gurdjieff said, "poisoned" with the truth of their own self-experiencing and so live in apsychological Work nether world, as we see with so many Internet "Fourth Way" forums and groups. Henderson's book offers an enticing onanistic "solution" for their dilemma. Just what were Henderson's motives for writing Hidden Meanings? Does he really believe people can awaken by themselves with only the "help" of Gurdjieff's books? Is his book enough of a guide? If not, who will this "guide" be? Though not directly spoken, it does become evident near the book's end that Henderson, the writer/excavator, directs his readers in the use of an embedded exercise, thus taking on the role of the teacher. This exercise, quite amusingly concealed in Herald, is an alternate breathing exercise, preliminary at that, but whose discovery for Henderson was his "eureka moment." It is too bad he didn't take to heart what one of his wise men, Frank Pinder, said, "There is no short cut to inner development…. Those who have taken up the Work, leave it for a seemingly easier way, will … have to begin again." To salve his wounded egotism, Henderson takes on the cloak of Gurdjieff. This cloak, as was mentioned earlier, takes the form of an annoying and shameless mimicry of Gurdjieff's style of writinga poor imitation it must be said. What was Gurdjieff's purpose for undertaking his writings and his intended use for his writings? "Gurdjieff both wrote and spoke in a picture-form of speech, symbological language, which is necessary for understanding. . . . Allegory forces one to ponder. . . . This is a principle in all objective methods and techniques." On its face, there is agreement with Henderson, as noted earlier. This is the teaching Gurdjieff brought to the West and he wished that it would be preserved in the manner of a Legominism. That is, in a form that would be less likely to be destroyed by geological catastrophes and by what Gurdjieff calls "Transapalnian perturbations" as well as the process of "reciprocal destruction." Taking Gurdjieff's own words as to what a Legominism is, we see that it can be strongly argued that it was never his intention that this teaching could be transmitted entirely in book form. "This word Legominism . . . is given to one means existing there of transmitting from generation to generation information . . . through just those three-brained beings . . . worthy to be and who are called initiates." If a Legominism is transmitted through initiates, why even have books? It is likely, but not known, that Gurdjieff felt this was both a fail-safe for preservation, as well as a means of spreading the teaching and that the books could be a useful adjunct and a clarification for the oral teaching. Some 60 years have passed since Gurdjieff's death, and the process of distortion, as well as deviation, of this seminal and esoteric teaching is well under way. Gurdjieff continually and pointedly both wrote and spoke about the destruction and distortion of the teachings of the past. While not yet destroyed by war or geologic catastrophe, Gurdjieff's teaching has been distorted by wiseacrings that have spawned a proliferation of faux Work groups, and the esoteric ideas and practices have been arrogated in part by the ever growing and winding paths of New Age eclecticists. The teaching's core does remain intact but, without doubt, many earnest seekers have been lost to the faux groups. Do Henderson's excavations help to stop this process of distortion? The sense is no. While Henderson does believe he is acting to preserve the teaching, and as he says to move Gurdjieff's "very big plan" forward, the book is, in fact, doing just the oppositethat is, contributing to the process of its public leveling and dilution. 1. Regarding unpublished texts. Henderson makes note on p. 237 of a response given on what is presumed to be an internet forum to his "call" for assistance. Henderson was having trouble finding a certain text in manuscript form. This "call" was, according to Henderson, kindly responded to by Dennis Mullane. Mullane in email conversation has a different take on the story. "John is a writer who wants to sell books. His account of how I came to his rescue is totally fabricated. We discussed that I had some manuscripts from Gurdjieff's writings, but I refused to send him copies. It was only after Mr. Gurdjieff's daughter [likely the problematic Dushka Howarth] contacted me and asked me to "be nice" to him that I agreed to send him copies. I instructed him not to mention my teacher's name (where I got the material) in a very clear and definite way. Well, he concocted this story of how nice I was to come to his rescue, then inserted my teacher's name [who had been at Mendham in the 1950s and later became interested in Zen]." 2. Mme de Salzmann. Henderson uses Gurdjieff's writings in Beelzebub's Tales, p. 659, to equate Mme de Salzmann to the poisonous gas Zilnotrago or cyanic acid. Zilnotrago fills the solar system Salzmanino. It might have been a good idea if Henderson had considered attaching the suffix ino, which is diminutive and masculine, on the word Salzmann. 3. Types. As Gurdjieff states in Herald, pp. 23–25, he needed "to have at my disposal representatives of all the 28 'categories-of-types' existing on Earth." This led him to form his Institute. Further, he goes on to say, "To make use of people, who display a special interest in an Institute founded by me, for purely personal ends would surely strike those around me as a manifestation of 'egotism,' but at the same time the people, who had anything to do with such an Institute established by me, those, namely, whom I have previously mentioned and in whom the predisposition proper to all menthat of acquiring data and of preparing in their being the soil for the impulse of 'objective-conscience' and for the formation of so-called 'essential-prudence'had not yet entirely atrophied, could, in this way alone, profit by the results of knowledge amassed by me due to exceptional circumstances of my life, and which had regard to nearly all the aspects of reality and objective truth, and thus use them for their own benefit." 4. What is Akhaldan? C.S. Nott, Teachings of Gurdjieff (London: Arkana, 1990), p. 204. 5. Catastrophes. It is interesting to note that the first of the catastrophes on Earth, that of Moon and Anulios being split from the planet is a general catastrophe and has cosmic implications and also may explain fundamental human bifurcation. The second catastrophe, the "engulfing" of the continent of Atlantis, does not have cosmic implications but seems to have had a widespread effect on the Earth. Gurdjieff also speaks of Transapalnian perturbations of a local nature. This description is reserved for specific geographical areas. As Gurdjieff is using all these catastrophes as well as other specific geologic features as allegorical references to the human condition, one might reasonably assume that he found the peoples of these areas and or their religions specifically "damaged" or changed by these local perturbations and to have characteristics unique to the area of their arising.